"We're here to honor their service, to honor their commitment to duty and selflessness," event chairman Joe Occhipinti told the Staten Island Advance. "We recognize their selfless service for the country and for the men aboard that ship." The annual event pays tribute to Jewish Rabbi Alexander Goode, Methodist minister George L. Fox, Dutch Reformed minister Clark V. Poling, and Catholic priest John P. Washington. 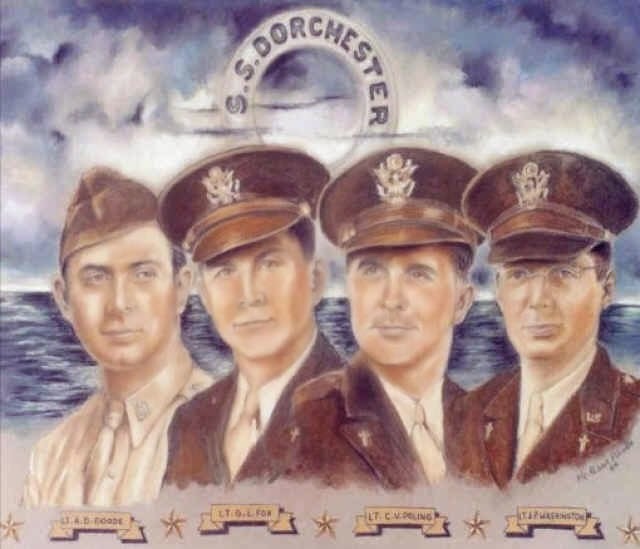 In 1943, the four Army chaplains joined 900 soldiers aboard the USAT Dorchester as they headed for Nazi-occupied Europe. At 12:55 a.m. on Feb. 3, a torpedo from a German submarine ripped through the hull. Working against time, the chaplains passed out life vests from the lockers until they ran out. Then they took off their own life jackets and gave them to other men. The four chaplains were last seen standing arm in arm at the top of the ship singing hymns as the Dorchester sank beneath the waves. Of the 920 men on the ship, only 230 survived. The Staten Island Advance reported that guest speakers at the breakfast included Dan Ocko, assistant director of the Chapel of the Four Chaplains in Philadelphia -- an organization dedicated to preserving the memory of the four chaplains -- and the Rev. Mother Rhoda Margaret Treherne-Thomas of St. John's Episcopal Church.